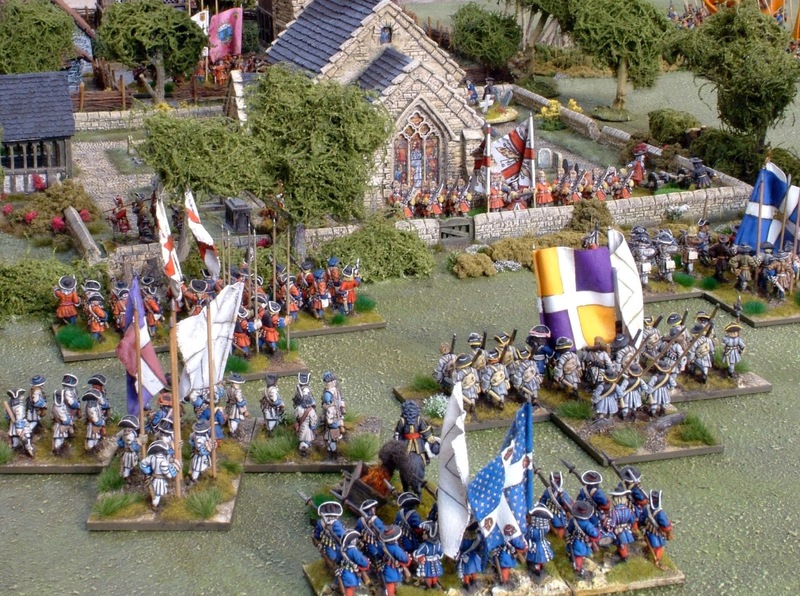 Our game was representational and not a truly accurate recreation of the battle. For those unfamiliar with Walcourt it stands out as the only Allied victory in Flanders of any significance until Namur fell in 1695. British infantry distinguished itself in an evolving battle which had several distinct phases. Marlborough was a natural choice to command the British force of 8,000 men sent to the Low Countries in the spring of 1689. He was senior and experienced, and William might have thought it safer to send him to the Continent rather than to Ireland, where James had arrived in March, in case his newly professed loyalty became strained. Marlborough’s contingent formed part of the small army commanded by Georg Friedrich, Prince of Waldeck, intended to hold in check a French army of around 40,000 under Marshal d’Humières, which had moved into the southern portion of the Spanish Netherlands at the beginning of May. The main French effort was to be made on the Rhine, and d’Humières was simply bidden to remain where he was. Waldeck, with roughly the same number of men, felt unable to dislodge him. Marlborough had made his mark even before his men had fired a shot in anger. The events of the past six months had left the army confused and humiliated. In many regiments officers and men had not yet got to know one another; William’s preference for all things Dutch was especially galling to the foot guards, who saw the Dutch Blue Guards replace them on duty in London, and there were still some Jacobites in the army who, usually when in drink, noisily aired their affection for James II. Desertion, that running sore of the armies of the age, was a major problem, and was not helped by the ease with which an agile man could slip between allied or even enemy contingents, scooping an enlistment bonus every time he did so. Many observers believed that the débâcle of 1688 was a fair comment on the British army, and we cannot blame them. Even Waldeck, not history’s liveliest general, thought that Marlborough’s soldiers suffered from ‘sickness, slackness, wretched clothing and the worst of shoes’. The campaign that follows is Marlborough in miniature. He had three months to train and discipline his army before exposing it to the test of battle. He drilled it hard, worked tirelessly at getting uniforms, arms and equipment into order, and by July Waldeck was reporting to William that he could not ‘sufficiently praise the English’, and that he found ‘the whole so well ordered that I have admired it, and I can say that Monsieur Milord Marlbrouck and the Colonels have shown that their application has had a good effect’. On 26 August Waldeck crossed the Sambre near Charleroi and camped, some ten miles further south, just north of the small walled town of Walcourt. He probably did so simply to give a fresh opportunity to his foraging parties. These were not small groups of soldiers striving to buy or steal food for themselves (although some men seized any opportunity to take extra rations or even to desert), but organised parties bent on collecting hay for the cavalry. At this time of the year hay had already been mown, but earlier in the season they would have been compelled to cut grass themselves. The armies of the age usually contained two horses (mounts for the cavalry and officers as well as draught animals for guns and wagons) for every three men. A force the size of Waldeck’s needed to find some 25,000 pounds of hay a day during the campaigning season, and it was impractical to carry it long distances. Like sharks, constantly on the move to keep water passing through their gills, the armies of the era needed to amble across the landscape to bring fresh forage within their reach. Armies engaged in foraging were axiomatically vulnerable. D’Humières had, in any case, recently been reinforced, and as soon as he saw that Waldeck had his foragers out he attacked them. 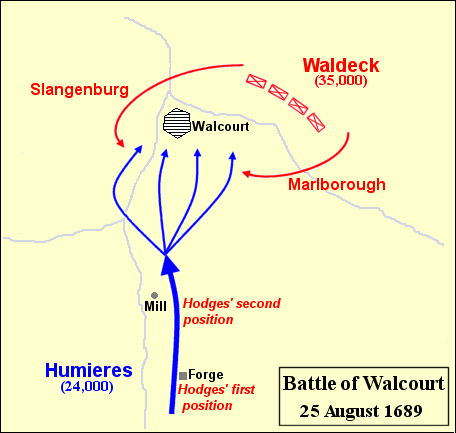 On 27 August a single British battalion under Colonel Hodges was posted in the valley about two miles south of Walcourt to act as a rallying point for the foragers, and there were Dutch horse and dragoons further south. As the French advanced northwards the Allied cavalry patrols fell back in contact with them, giving the foragers time to get away. Marlborough rode forward at about 10 a.m. to find Hodges’ men, who had ‘lined some convenient hedges’, in good order but under growing pressure, though happily the ground did not allow the French to hook round on either side of the battalion. With the aid of some cavalry of his own, he brought Hodges back, first to a watermill halfway to Walcourt, and then right back to join the rest of his force, on the high ground just east of Walcourt itself, though not before Lieutenant Colonel Graham and Captain Davison had been mortally wounded and about thirty men killed. At this stage d’Humières could quite well have broken off the action without discredit: if he had failed to catch the foraging parties he had at least brought the process to a premature halt. But, inflamed by the clash so far and unaware that Waldeck had now concentrated his whole army in and around Walcourt (the great hill on the town’s east not only offered excellent fields of fire to Marlborough’s guns, but screened from view the troops behind it), he pressed his attack. It is possible that the poor reputation then enjoyed by British troops induced him to take risks he might have deemed inappropriate with others. The defences of Walcourt itself were old and ramshackle, and the place was held by a single Luneburg regiment. A determined party of Gardes Français piled faggots against the town’s gates and tried to set them alight, but Waldeck reported that ‘most of them were killed’. At about 2 p.m., Brigadier General Thomas Tollemache took his own Coldstream Guards and a German battalion into the town to strengthen its garrison, and further French assaults were beaten off with heavy loss. Marlborough was to become a master of feeling the balance of a battle, and Walcourt helped him develop this quality. When d’Humières’ men were played out by successive attacks on the town, Waldeck ordered a counterattack. At about 6 p.m. Major General Slangenberg’s Dutch infantry went forward on his right, and on his left Marlborough personally led the Life Guards and the Blues in a charge that broke the leading French infantry (the French acknowledged six guards battalions ‘for the most part ruined’) and decided the battle at a stroke. He would have done even more damage had d’Humières’ cavalry commander, Claude de Villars (a veteran of the siege of Maastricht, where he and Marlborough had been on the same side), not led his own horsemen into the battle to help the beaten infantry limp away. The French lost perhaps as many as 2,000 men (including a brigadier general and the colonel of the Royal-Champagne infantry regiment) and six guns to no more than three hundred Allied casualties. Although Waldeck was not able to mint any larger currency from this little victory, and the campaign ended with inconclusive countermarching and cannonading, he praised Marlborough to William in the most glowing terms, adding: ‘I would never have believed that so many of the English would show such a joie de combattre.’ His formal report to the States-General noted: ‘All our troops showed a great courage and desire to come to a battle; and particularly the English, who were engaged in this action, behaved themselves very well.’ A delighted William told Marlborough: ‘It is to you that this advantage is principally owing,’ and gave him the colonelcy of an infantry regiment (later the Royal Fusiliers) as a reward. D’Humières, in contrast, dubbed le maréchal sans lumière by his unhappy subordinates, never again enjoyed operational command. When the tide of war lapped across the same region in 1690 that frail but energetic warrior Marshal Luxembourg was in charge. He first trounced Waldeck at Fleurus, and went on to win a string of victories which did much for flagging French morale.